An acquaintance of mine sent me the link to this now-defunct northern California band that put a demo out called “The New Breed” in 1991. People send me links to bands all the time and 99% of it is not to my liking. This is a bit different. I don’t know much about them except that their singer replaced Carl Albert (ex-Vicious Rumors) in his old band Villain. It’s obvious they hit the scene a little too late as corporate music (radio/MTV) were putting radio friendly grunge on the radio and not so much metal. Anyway, check it out. It’s good! Power/Prog type stuff but not over the top. 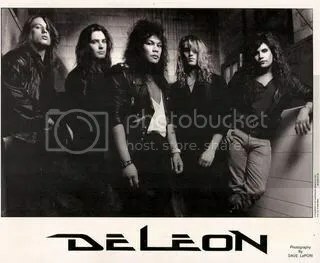 DeLeon reformed in the 2000’s and became “Stone Sonic” in 2009 and just released their new CD – “Not Your Typical High” in 2011.